The American Academy of Pediatric Dentistry (AAPD) recommends that a child go to the dentist by age 1 or within six months after the first tooth erupts. Primary teeth typically begin growing in around 6 months of age. NOMAD is designed with safety in mind. A unique, external backscatter shield and internal radiation shielding protect the operator from radiation exposure. In fact, the exposure from using NOMAD is orders of magnitude less than allowed by the FDA. NOMAD radiation exposure is less than 1% of the allowed occupational doses. NOMAD is safe! Sealants are a thin, plastic coating that is painted on the chewing surfaces of teeth -- usually the back teeth (the premolars, and molars) -- to prevent tooth decay. The painted on liquid sealant quickly bonds into t he depressions and groves of the teeth, forming a protective shield over the enamel of each tooth. 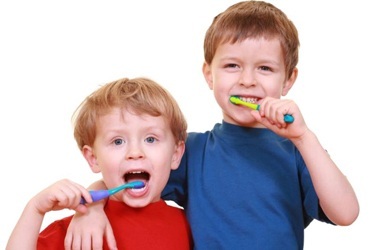 Typically, children should get sealants on their permanent molars and premolars as soon as these teeth come in. 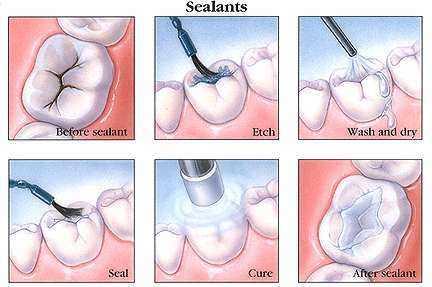 In this way, the dental sealants can protect the teeth through the cavity-prone years of ages 6 to 14. However, adults without decay or fillings in their molars can also benefit from sealants. Sealants can protect the teeth from decay for many years, but they need to be checked for chipping or wear at regular dental check-ups. 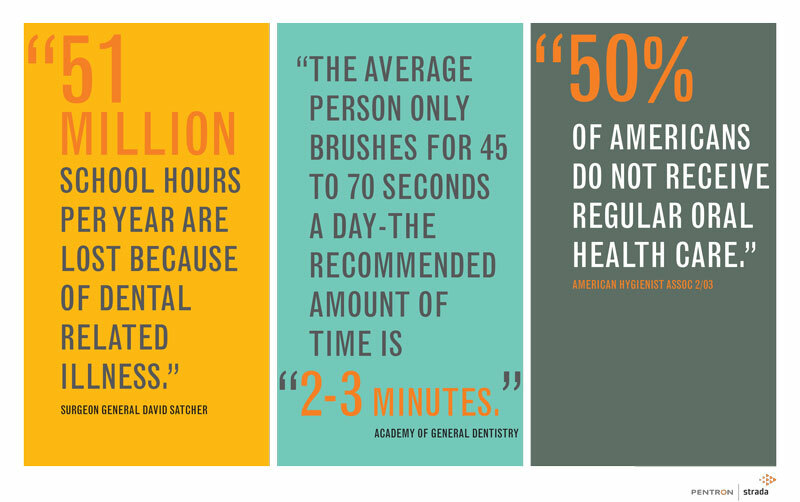 um disease or periodontal disease or gingivitis as it is also called is the number one cause of tooth loss today. The reason you loose teeth from gum disease is because this disease attacks the gums as well as the bone, which are the foundation in which your teeth rest. As the bone literally dissolves away from around your teeth, your teeth become loose and eventually fall out. Anyone at any age is susceptible to gum disease. Gum disease is caused by plaque. If the plague is not removed on a daily basis it will form calculus, which is the breeding ground for the germs which cause periodontal disease. Bleeding gums are the first sign that there may be a problem with the gums. Puffy, tender red gums are also a sign that there is an infection present. Bleeding gums however are not always present even in severe cases of gum disease. Routine and regular visits to your dentist are the best way of catching gum disease in its early stages before too much damage has been caused. Gum disease will not go away by itself or with improved home care. The only way of removing plaque deep under the gums is with professional cleanings. Once you have had a gum problem you will always be susceptible to recurring problems, so be sure to see your dentist on a regular basis - every two to three months, unless he or she recommends otherwise. A substance known as plaque causes tooth decay. Plaque is a clear bacteria laden film, which develops on the teeth. The bacteria in plaque interact with the starches and sugars we eat and form an acid, which breaks down or de-mineralizes our teeth. As this process is going, on our saliva along with properties it has, acts to help re-mineralize teeth. When the demineralization process is faster than that of remineralization a cavity occurs. There are several things that can be done to slow down or totally prevent this breakdown process which leads to cavities. One of the most important contributors to decay are sugars, and eliminating or drastically reducing your intake of them will help greatly in preventing tooth decay. Proper brushing and flossing, and removal of the plaque will also help in preventing breakdown. Home fluoride rinses help aid in the remineralization process. Of course routine visits to your dentist are of importance not only in the early detection of cavities but professional cleanings and fluoride treatments are very important in maintaining a healthy happy mouth. If effect, the recommendation to visit a dentist every 6 months is to catch tooth decay early before it does serious damage to the tooth. Well, gum disease is a horse of a different color. Under the right conditions, such as not taking proper care of your gums, it can develop in a week. Regular dental visits are important because they can help spot dental health problems early on when treatment is likely to be simpler and more affordable. They also help prevent many problems from developing in the first place. Visiting your dentist regularly is also important because some diseases or medical conditions have symptoms that can appear in the mouth.